New resource: Free Study Guide for "Alive in Him"
Crossway has graciously made an "Alive in Him" Study Guide available for FREE! Click here to download the free pdf. My next book, Alive in Him: How Being Embraced by the Love of Christ Changes Everything, releases at the end of March. I wrote this book out of my enthusiasm for Paul’s letter to the Ephesians. (Writing everything down helped a bit, but I still can't stop talking about Ephesians!) One can hardly overstate the significance of the themes Paul writes about in his letter—every word is enchanting. My prayer for Alive in Him is that it would help people dive deep into Ephesians and see for themselves how being embraced by the love of Christ changes everything. If you want to help spread the word about the book later in March, you can check out the launch team page with shareable graphics, quotes, and a video. I've long admired John Ensor's work as he travels and teaches on the gospel and the sanctity of human life. As a follower of Jesus, and in my experience as a volunteer doula and mother of four, there are times when I’ve been asked to explain the Christian perspective of labor and birth. It’s my privilege to talk with ladies from different religions and answer their questions about what the Bible says regarding labor pain and childbirth. In my local church context I’ve also had opportunities to encourage Christian women, discussing how the Bible renews our minds and addresses our misconceptions. And thrills our hearts with this incredible picture of grace! Since I don’t have any one place where these thoughts are written down for easy reference, I hope this list will serve as a helpful, go-to resource. These ten points and accompanying Scripture references aren’t comprehensive by any means— I tried hard to be succinct. Childbirth (new physical life) is evidence of God’s mercy. God would have been perfectly just to not allow Adam and Eve to live after they sinned against him in the garden of Eden. Ever since then, we have all been born into sin and deserve death and punishment for our sin (Ps. 51:5). Life is a precious gift from our holy God. Our response to life is heartfelt gratitude to God and humility. God commissioned Adam and Eve to be fruitful and multiply (Gen. 1:28), but then as part of the judgment for their sin, God said he would “greatly multiply pain” in being fruitful (Gen. 3:16). In this regard (contra some philosophies of childbirth), a woman’s labor pain is unlike that of a-moral animals. Birth pains are a specific part of God's judgment on Eve for her sin (Gen. 3:16), pointing us to our need for a Savior. But painful and mortally dangerous pregnancies are not God’s final word, for he has promised a Rescuer (Gen. 3:15)! The pain we experience in childbearing is a call to repentance and faith, like a flashing neon sign that points us to the cross, where Jesus suffered in our place to deliver us from the wrath of God (Rom. 5:9). All women and babies who are delivered through the pains of labor are recipients of God's undeserved, common grace. (Pain relief--medical or non-medical--is a gift.) Praise God! All people everywhere who are delivered through the Redeemer who was “born of a woman” (Gen. 3:15, Isa. 7:14, Gal. 4:4, 1 Tim. 2:15), are recipients of God’s undeserved, saving grace. What wondrous love! Jesus is our Redeemer. Shockingly, our Redeemer came into this world as we all did... through the judgment of birth pain. Because of Christ's sacrifice on the cross, we now have redemption through his blood, the forgiveness of our trespasses, according to the riches of his grace (Eph. 1:7). We do not have redemption or forgiveness through our fertility. We do not “trust birth” or our bodies; we place our trust in the living God in whose hand is the life of every living thing and the breath of all mankind (Job 12:10). The Lord himself is our refuge (Ps. 18:1-2), not any training, experience, person, book, facility, method, or plan. God is the Creator of everything, including childbirth. From eternity past, God ordained the conversation that would take place in the middle of the night between Jesus and Nicodemus… “unless one is born again, he cannot see the kingdom of God” (John 3:1-21). We could infer that one reason Jesus created childbirth was so we could have a picture to help us understand what it means to be converted: called out of darkness into his marvelous light… “born again, not of perishable seed but of imperishable, through the living and abiding word of God” (1 Pet. 1:23). “According to his great mercy, he has caused us to be born again to a living hope through the resurrection of Jesus Christ from the dead” (1 Pet. 1:3). Both “natural childbirth” and “medical childbirth” are no more human accomplishments than is the act of receiving mercy from God. We all make our boast in Christ alone; Jesus deserves all the praise at all times in all circumstances. The flexible metaphor of birth pain appears throughout Scripture. In one place, the apostle Paul uses it to explain how our suffering produces future glory. Christians are expectant of a final deliverance from sin and death; however, in this present time we groan [in birth pain] inwardly, as we suffer with Christ, “that we may also be glorified with him.” In his resurrection, Jesus burst through death to become the first man in the new creation. Because of this hope, we believe that our sufferings “are not worth comparing with the glory that is to be revealed to us” (Rom. 8:17-25). In other words, the joy of resurrection life outweighs the pain it takes to produce it. This is yet another way that the process of childbirth points us to Christ. Jesus was delivered up to be crucified in our place for our sin according to the definite plan and foreknowledge of God. God raised him up, loosing the pangs of death, because it was not possible for him to be held by death (Acts 2:22-24). Whenever a woman or child is overcome by death in the process of childbirth, we grieve deeply. Pain and death are not benign "facts of life." But we do not grieve as those who do not have hope, for the Day is coming when the one who overcame the pangs of death will bring to life again those who have fallen asleep (1 Thess. 4:13-14). All our groanings will end when we finally see what we’ve been hoping for as the consummation of God’s promised restoration bursts forth in full (Rom. 8:23-25). If you're not already aware of the "On My Shelf" series on the TGC blog, you might want to go check that out. I had a lot of fun answering questions about books I'm currently reading, which ones I re-read, and what God has been teaching me lately. You can find that interview here. Since we live "way over here," we usually get things late rather than early. One year a Christmas box arrived in March, for example. So... you can imagine how thrilled I was to view a pre-release copy of Episode 8 in the "Dispatches from the Front" DVD series! Who doesn't love getting good news early? Last year I counted down the days until I got my copy of the book, which is on my Top 5 list of books I recommend to moms. Our family has long benefitted from the DVDs-- they fuel our prayers and expand our imaginations as we see what God does through ordinary people who have a big view of his gospel. All that to say, it was exceptionally special to watch "No Retreats, No Regret" with the executive producer, Tim Keesee. Episode 8 is set in China, home to 1.35 billion souls - the highest population of God's image bearers on the planet. The kids thought they were meeting a movie star -slash- Indiana Jones hero. He even brought "the bag," "the orange watch," and "the journal" with him. They all enjoyed Tim's famous "M&M diplomacy," his strategy for making friends with kids all over the world. Watch the trailer for Episode 8, "No Regrets, No Retreat," then go check out the website to buy a copy and take advantage of their free US shipping. Can it be that we should gain an interest in the Savior's blood? My friend Caroline Cobb co-wrote this song with Sean Carter to tell the story. Caroline's album, "The Blood + the Breath," was gifted to me by a friend, and is now one of the few albums that I share with others saying, "You need to listen to this." I love to listen to it from the beginning to the end, as Caroline beautifully sings the story of redemptive history. A friend of mine sent me the text of this hymn as she was going to bed on the other side of the world, encouraging me in my work of carrying on "the global rhythm of prayer and praise." And now, at bedtime here in Dubai, I'm reminded of the profound truth that God's mercies are new every morning-- and it's always morning somewhere. It will likely take me an entire two years until the next conference in order to go back over all the incredible content from TGCW14. You can watch/download all of the audio (including some video) from the conference here. Included on that page is a workshop I did called "Missional Motherhood" in which I talk about things like death by caricatures, the season of life, the priority and privilege of prayer, and missional living as a mom. Where will you be 30 trillion years from now? If you are "in Christ" then you will still be there 30 trillion years from now. Our identity in Christ is fundamental both now and forever. I hope I never get tired of hearing this truth and being reminded to live rightly in accordance with it. I had the privilege of sitting down with Jamie Ivey and Fabs Harford to talk about this and more in this podcast for Verge Women (11 minutes). Why is Scripture memory like the unicorn of spiritual disciplines? The seemingly magical prize of a heart brimming with Bible is a treasure that many of us long for, but few profess to have found. If the Word of God is our very life (Deut. 32:47), why is storing it in our heart so hard for us? Lots of reasons come to mind. One reason is that despite our good intentions, we are very easily distra-- Squirrel! I can certainly identify with the struggle of being distracted from pursuing the good things I want to pursue-- like Scripture memory. But rather than dismiss this "unicorn" as a myth, or a creature of a by-gone pre-Internet era, I think our distracting circumstances can be leveraged to serve us. Not only that, but I've even gone on record to say that I think God intends for the circumstances he brings into our lives to propel us-- to lead us-- to draw us into meditation on his Word. Over at the Crossway blog I've written down four ways that our distractions can serve our efforts in memorizing God's Word. It's a short, non-comprehensive list I made up with an acronym to help me remember today what God has said in the P.A.S.T. ...and is doing and will do! I wanted to share a link with you for a really neat radio program called Haven Today, which is broadcast in the States and in Canada. In honor of Mother's Day they are airing a two-part interview I did with them about the hope and help we have in Christ as moms. You can take a listen here if you like. "You sure do have your hands full!" And if you're like me, when you're not carrying things (or small people) you feel kind of odd-- like you're forgetting something. Your check your pocket for the phone... That's not it... Shake your purse to make sure your keys are still in there... Wait. Why am I standing in the middle of the kitchen staring at a laundry basket full of toys, books, and empty coffee mugs? Because of the gospel, your hands aren't simply full; they're overflowing with every spiritual blessing in Christ. Check out the endorsements for Treasuring Christ When Your Hands Are Full on the book's Amazon page. Read "God Meets Busy Moms Right Where They Are," an excerpt from the book featured on The Gospel Coalition's blog. The multiethnic Bride of Christ has a gospel-glow about her. One time I had a conversation with a neighbor who noticed, and she insisted that I give her an explanation. I was seated on her living room floor drinking coffee and eating fruit when she brought it up. "Last night," she began, "I was watching your house." My eyebrows raised. She continued, "My face was stuck to the window all night." Our church had a potluck at our place the night before. I racked my brain to remember if the youth had played any particularly noisy games in the garden, or if I had seen any cars park in her driveway by mistake. What she really wanted to know about was what brought together all those different people to share a meal. The Lord had swung open a door for me to talk about the reconciling work of Jesus on the cross (both vertically with God and horizontally with each other) and how his death purchased for God worshipers from every tribe on the earth. Our local church is made up of people from about 60 different countries-- a tiny fraction of "every tribe and language and people and nation" (Rev. 5:9). "If you want to know the short answer," I concluded, "it's that we're united in one family through Jesus Christ." My neighbor was silent for a moment and then she responded, "I've never heard anything like that before in my life." I think we would do well to be slack-jawed at this race-reconciling gospel, too. One way to stoke the fires of affection for Christ is by marveling at his work in the lives of others. 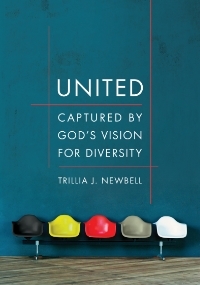 My dear friend Trillia Newbell has written a book combining those very things-- the beauty of racial diversity in the body of Christ and awe-struck wonder at the Savior who sacrificially ransomed his bride. Trillia skillfully defends from Scripture that Christians from different ethnicities are in fact, blood-related. Our unity is grounded in the blood-soaked cross of Jesus Christ, and therefore transcends things like nationality, neighborhood, economics, diet, education, and hobbies. Trillia's story points us to the gospel as our hope for unity as we look forward to the future. Because the grace of God has appeared and interrupted our futile efforts of self-glorification, God has promised that he would be the architect of a new city that is coming. This city has no temple "for its temple is the Lord God the Almighty and the Lamb." And this city has no need for the sun or the moon "for the glory of God gives it light, and its lamp is the Lamb." We will do something extraordinary in this light-- something we were created to do. We, the nations, are going to walk by that light together in the city, and the kings of the earth will bring their glory into it. We will have no more fearful suspicion of our neighbors, and instead of building walls around ourselves we will live in a city where the gates are never shut (Rev. 21:21-26). Glory together with Trillia in United how even now, when we walk in the light of Christ our fear and arrogance is replaced with blessing and honoring one another. This is a worship-full and enjoyable book. I love the fact that Trillia wrote United for her children. She says that she hopes they will read the book one day and wonder, "Why would Mommy see the need to write a book about this?" because the experience of racial discord would be so foreign to them. Amen. Check out Trillia's blog, where you can read more about United. You can also purchase the book on Amazon or Book Depository (free shipping worldwide). That is the underlying premise of Jessica Thompson's new book Exploring Grace Together: 40 Devotionals for the Family. Salvation by grace through faith in Jesus' substitutionary death on the cross! It's the drum beat that Jessica keeps playing over and over and over. It was the resounding chorus through her first book (co-written with her mother, Elyse Fitzpatrick-- Give Them Grace: Dazzling Your Kids with the Love of Jesus). It's the theme of everything Jessica blogs about. And it is the singular message through the family devotionals in this new book. Truly, there is nothing better Jessica could point us to than the gospel. Praise the Lord! We have no lasting joy outside of Christ. And our children are no different. I found each of these forty devotionals to be quick reads, but they are slowly simmering their way through ongoing conversations in my home. Jessica illustrates lessons from Scripture with real-life scenarios about children who are just like your kids and mine-- children who need to know the love of Christ. I think any elementary-age child would be able to latch on to the stories, engage in the candid discussion of Scripture, and rehash the teachings about the gospel throughout their everyday experiences. Jesus extolled child-like faith. And the precious irony of discipling our children is that the Spirit gifts parents with child-like faith as they go about this glad work. Exploring Grace Together is basically a collection of forty different reminders that we can all heave a collective sigh of relief that the burden of our sin has been lifted by Jesus himself and he gives us everything we need for life and godliness. I am so thankful for the way this book challenged me personally. Here's the thing-- I know (and heartily agree with) the truth that children need the gospel more than they need behavior modification. But in the thousands of little moments with my children throughout the days and nights, the first thing I want to reach for is behavior modification simply to make my life more convenient for the next ten seconds. Reading Jessica's book was like throwing kindling on a fire for my affections for Christ, whose grace is steadily and surely digging the roots of my convenience-idol out of my heart. Only Jesus can enable us to love grace forever more than we love ten seconds of convenience. You can pre-order Exploring Grace Together on Amazon and The Book Depository (free shipping worldwide). But if you can't wait two weeks for a hard copy to come in the mail, the Kindle edition is available now. Follow Jessica on Twitter, read more about her first book Give Them Grace, and be encouraged by these blog posts by Jessica on the Resurgence blog. Crossway is offering a chance to win an advance copy of Treasuring Christ When Your Hands Are Full! The giveaway ends on Valentine's Day-- to find out how to enter, follow this link to their blog. Modesty is a hot topic. This is especially true where I live because I often find myself drenched in sweat in an effort to wear modest clothing! I was delighted to participate in a lively conversation about modesty and other sundry things in this podcast on the "Mortification of Spin." You can read Carl Trueman's cheeky introduction here. The other female voice you hear on the podcast is the ever-deft Aimee Y. Byrd, author of The Housewife Theologian. Someday I'm going to ask her what the "Y" stands for. The MoS podcast is a ministry of the Alliance of Confessing Evangelicals. They've got so many resources available on their website that I've got my "ACE tab" open at all times (unless I'm cleaning my desk[top], at which time the only thing open is iTunes playing U2's "I Still Haven't Found What I'm Looking For"). Last week I asked for prayer for a talk I was to give at our church's ladies' discipleship class. Thank you for praying! I had about 20 minutes to let loose a fire hydrant of Scripture and questions for further study on the subject of assurance of salvation-- what it is founded on and what it has to do with discipleship. I found it to be quite challenging to prepare this material mainly because of both the magnitude of the subject and the incredible diversity in the backgrounds present in our church. From the feedback I received afterward, the fire hydrant method was effective. That is, a water gun can hit a single issue/question, but a fire hydrant can soak everyone in the vicinity. That fire hydrant, of course, is the unparalleled work of Jesus on the cross that is effective for salvation and sufficient for our assurance for-ever. We can all, no matter of what our background was before we came to Christ, find eternally-satisfying answers to all our particular questions in the gospel. I beefed-up the outline I used to speak from with complete sentences so that the ladies could use it for reference. You can download it here if you like. Greg Gilbert's What Is The Gospel? Mike McKinley's Am I Really A Christian?